This airticle is aboot the ceety in Mexico. 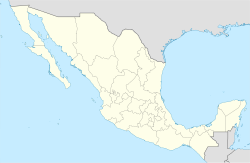 For ither uisses, see Torreon (disambiguation). 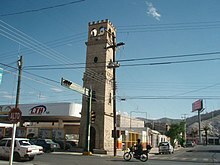 Torreón (Spaingie pronunciation: [toreˈon]) is a ceety an seat o the surroondin municipality o the same name in the Mexican state o Coahuila. As o 2010, the ceety's population wis 608,836 wi 639,629 in the municipality. The metropolitan population, includin Matamoros, Coahuila, an Gómez Palacio an Lerdo in adjacent Durango, wis 1,215,993. It is the ninth-biggest metropolitan aurie in the country an is ane o Mexico's maist important economic an industrial centres. Torreón is servit bi Francisco Sarabia Internaitional Airport, a smaw airport wi flichts tae several ceeties in Mexico an the Unitit States. Accordin tae airchaeological fyndins, the aurie o Torreón wis populatit aroond the 10t millennium BC. The first Spainyie mission arrivit in 1566, led bi Fr. Pedro Espinareda. Housomeivver, the ceety developit anerly in the unthirlt Mexican era, aroond a Torreón ("Big Touer") built tae monitor Río Nazas's floods, in conjunction wi the creation o a railwey connectin tae the US border ceety o El Paso, which gave an economic boom to the city and therefore a population boom as well. The population grew frae 200 in 1892 tae 34,000 in 1910. Torreón receivit city status in 1907. Durin the Mexican Revolution, the ceety wis taken mair than ance; the maist prominent character iver tae take the ceety wis the revolutionar general Pancho Villa. Durin the revolution, Torreon wis the steid tae a important convention which led tae a deal atween the insurrectit airmies an aw. Efter the Mexican Revolution, the ceety continued tae develop economically; durin the first years o the 20t century the primar industry o the ceety wis fermin, awtho ither industries later formit or wur established in the aurie. On 15 September 2007, Torreón celebratit its first 100 years as a chairtered ceety. It held a series o cultural events frae 15 September 2006 tae 15 September 2007, culminatin on the day that the ceety turned 100 years auld. Torreón is near the soothwast border o the state o Coahuila, athin the Laguna region o the state. The border is delineated by the Nazas River that separates it frae Gómez Palacio, Durango. The municipality covers 1,947.7 km2 (752.0 sq mi), includin hintle o the landwart aurie sooth o the ceety. Its elevation is ower 1,000 m (3,280 ft), which is law for the Mexican interior. The terrain whaur the urban aurie is spread is generally flat, wi somewha prominent relief formations (up tae 1,600 m (5,249 ft) sooth an soothwast o the ceety, thus visible at well-nigh ony gien point in the ceety. Heicher muntains, ower 3,000 m (9,843 ft), are on the soothren, maistly uninhabitit section o the Municipality, the maist prominent bein El Picacho. The ceeties o Torreón, Gómez Palacio, an Lerdo compone La Laguna (The Lagoon) or Comarca Lagunera, a basin athin the Chihuahuan Desert, which haes hintle economic activity. The name o the region stems frae three nearbi, an nou dry lagoons, the Lagoon o Mayran, the Lagoon o Tlahualilo an the Lagoon o Viesca. The region's climate is arid: rainfaw is scarce but mair prominent in simmer, whilst temperaturs are vera hot bi day an ceul at nicht, awtho the urban heat island effect causes temperaturs on simmer nichts tae be considerably wairmer than nearbi auries. Flora an fauna are those common tae semidesert habitats. The ceety is 56 km (35 mi) soothwast o historic San Pedro de las Colonias, whaur some o the Mexican Revolution fechtin occurred. Cristo de las Noas, at 21.80 m (71.5 ft), is the third tawest statue o Christ in Laitin Americae, anerly smawer than the statue o Christ The Redeemer in Brazil an Cristo de la Concordia in Cochabamba, Bolivie. Situatit on the top o a hill, this image o Jesus wi extendit airms seembolises protection for the inhabitants o Torreon. The hilltop haes a Catholic kirk an affers a view o the entire ceety. The aurie wis oreeginally a centre for ranchin. Wi irrigation the ceety became an important centre for support for fermin an processin o cotton. The ceety haes industries in textiles, clothin an metals processin. It is close tae facilities belangin tae Peñoles, an important Mexican minin group, an Motores John Deere (Agricultural an Construction machinery ingines) amang ithers. Torreón haes a fitbaa team in the Primera División de México, Santos Laguna. The team won championships in 1996, 2001, 2008, an 2012. . The ceety is hame tae a basebaw team cried Vaqueros Laguna an aw. Torreón's profeesional basketbaw team, Los Algodoneros de Torreon, play in the Municipal Auditorium, which seats approximately 3,000 fowk. They are members o the LNBP (Liga Nacional de Baloncesto Profesional) which is considered tae be the top basketbaw league in Mexico. On 2 October 2004, in a game played against Durango, Issac Gildea set the aw-time scorin record in the LNBP for a single gemme wi 61 points. The main annual festival in Torreón is the Cotton an Grape Fair (Feria del Algodon y La Uva) which taks place in the middle twa weeks o ivery September in the auld Plaza de Toros an the New Coliseum in Torreón. It conteens cultural events, muisic, amusement rides, an bullfechtin. The Laguna DrumFest taks place ivery October, an includes some o the best drummers in Mexico an frae aroond the warld. ↑ Travel Torreón. "Cristo de las Noas". Retrieved 28 July 2010. ↑ [deid airtin] "Cristo de las Noas". Archived frae the oreeginal on August 14, 2007. Retrieved 2007-09-17.